Camping along Wonderland Trail or at climber base camps will be on first-come, first-served basis this summer. Hikers and climbers dreaming of making a “bucket list” loop of the Wonderland Trail or a climb to the peak of Mount Rainier this summer just got news of a potential game-changer in their planning. Mount Rainier National Park officials say a “critical failure” of the park’s wilderness-camping reservation system due to a power outage during a recent storm means the park will dispense all backcountry camping permits on a first-come, first-served basis for the entire 2016 summer season. So, Wonderland Trail backpackers who’ve already picked out hiking dates and sent a request with routes and campsite choices won’t get a reservation at all, but instead must show up in the park up to one day in advance of their hike and queue up at a ranger office in hopes of getting one of a limited number of campsites for their preferred route. Park officials hope to make the best of it, but don’t be surprised by some long lines at ranger stations. In a typical year, wilderness camping reservation requests received between March 15 and April 1 would be processed in random order starting April 1. In past summers, the park has normally allocated about 1,200 reserved permits for the highly popular Wonderland Trail system, and also retained about 30 percent of available campsites for walk-ins. Camping permits are limited based on the number of campsites and to lessen the impacts on fragile ecosystems. Permits are not required for day hikers. The number of wilderness reservation requests has boomed in recent years, primarily for Wonderland Trail campsites. Before 2013, the number of requests received during the first two weeks of the reservation period averaged in the hundreds. In 2013, it increased to 1,400, and then climbed in 2014 to 2,000. Last year, more than 2,600 requests were received by March 31, prompting the park to close reservations at that time. King noted that the park had problems with its reservation system in 1999 and had to revert to a walk-in system that year. Those coming from the Puget Sound region, which represents about 90 percent of the permits issued, might do best to plan their park visit for midweek, rather than on a weekend, to avoid the longest lines at ranger stations. 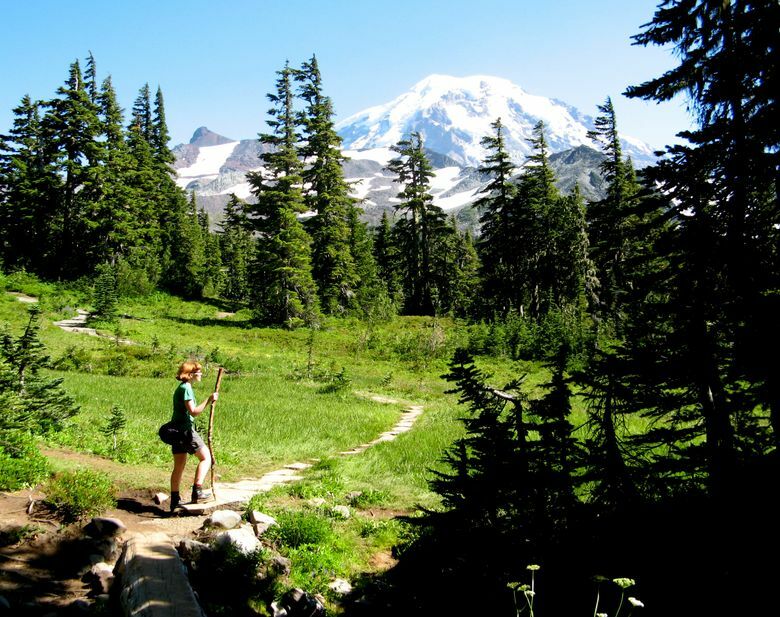 The Wonderland Trail is a challenging hike that encircles Mount Rainier. Its 93 miles includes 22,000 feet of elevation gain and loss. The trail has 18 trailside wilderness camps and three non-wilderness campgrounds. “Our peak visitation months at the park for backcountry use is July through September,” King said. This year there is significant snow coverage on the ground in the subalpine areas the Wonderland Trail traverses. Depending on how much snow melts in the spring the trail system won’t likely be accessible until mid-July. “That kind of situation will concentrate the demand on permits,” King said. A new reservation system should be in place by this time next year. The park has been developing an online reservation system in partnership with the University of Washington Information School. The new system will be tested this summer with a launch in March 2017. It will eliminate the old mail-in and fax-based system. Any reservation requests sent in by mail or fax this season will be returned unprocessed, and no fees will be assessed. No fee will be charged for walk-up permits, which can be issued up to one day before a trip start date or on the start date. Wilderness permits must be obtained in person at the Longmire Wilderness Information Center and the White River Wilderness Information Center from 7:30 a.m. to 5 p.m., or the Carbon River Ranger Station (hours vary, so visitors should call first: 360-829-9639). To avoid potential issues this summer, campers should call before heading to a ranger station. For Wonderland Trail updates, see 1.usa.gov/21KQ4aG. Information needed to obtain a permit include: an emergency contact phone number; license plate number of any vehicle being left in the park; and make, model and color of the vehicle. The wilderness reservation system failure doesn’t affect the reservation process for “front-country campsites” at Ohanapecosh and Cougar Rock campgrounds. They can be processed through www.recreation.gov. Seattle Times outdoors editor Brian J. Cantwell contributed to this report.